Doesn’t time fly past. 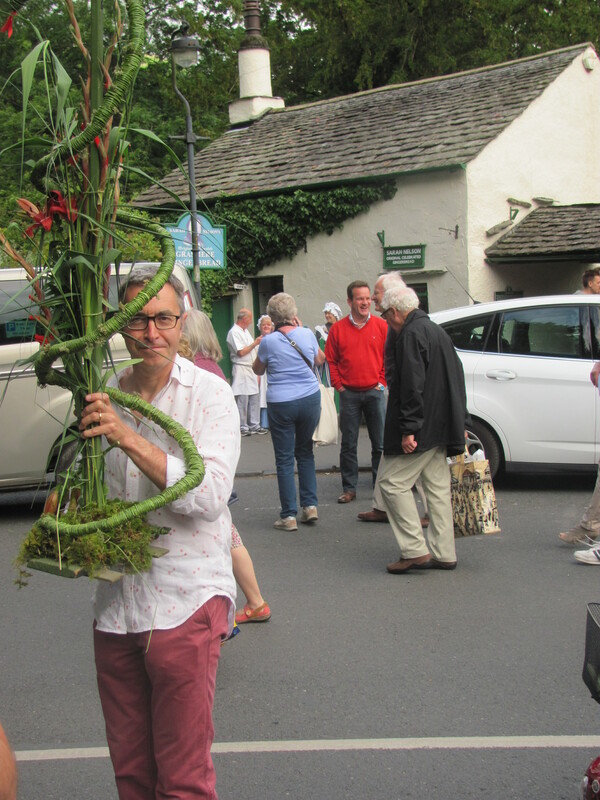 Another year another Rushbearing Ceremony in Grasmere. 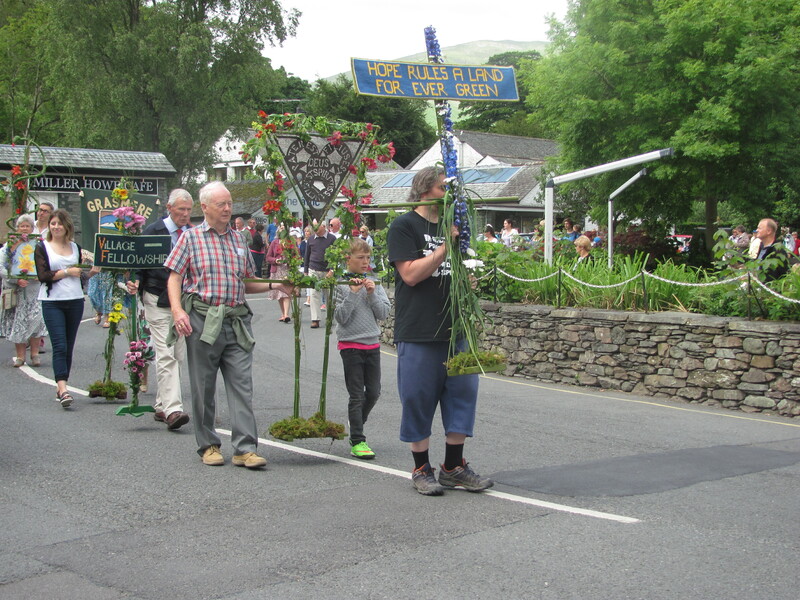 I have written about the history of Grasmere Rushbearing many times in this blog, but it never fails to be one of my favourite days in the village. 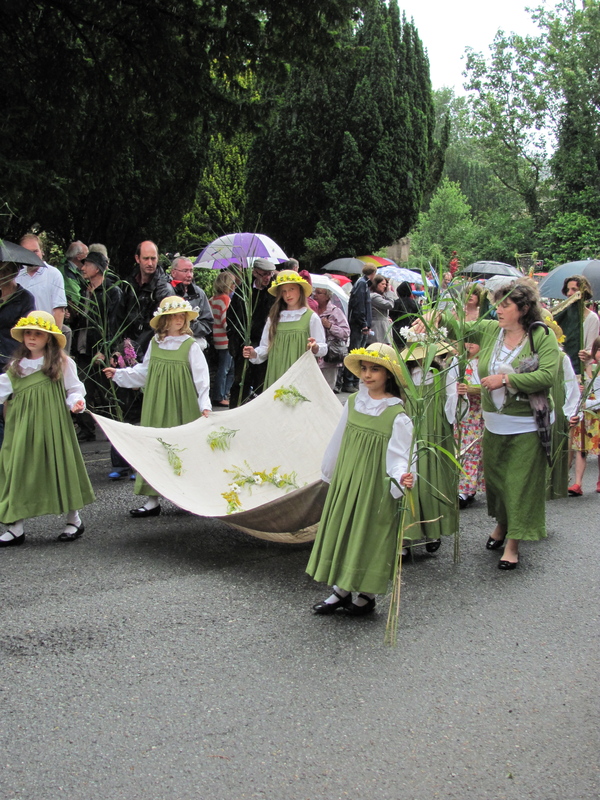 After a weather forecast that wasn’t looking good at all, the procession took place with dry weather. 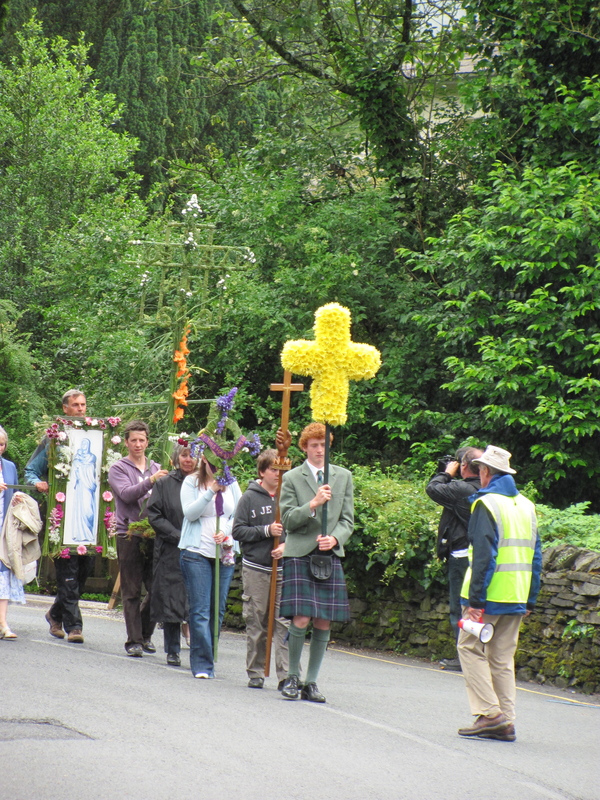 I was actually at work but dashed down the hill to view the procession and take some photos. 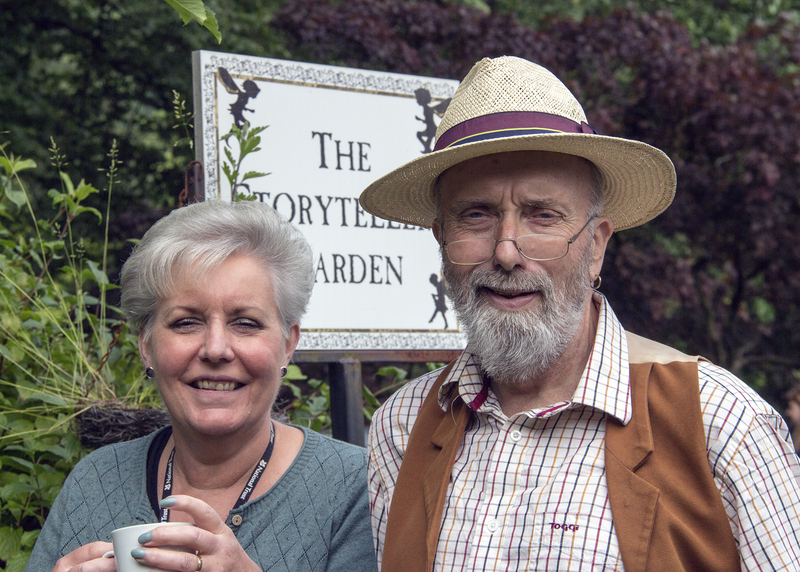 I always have a dilemma about where to stand but my good friend Taffy the Grasmere Storyteller took the decision out of my hands when he offered a cup of tea in the Storytellers Garden to enjoy while watching. 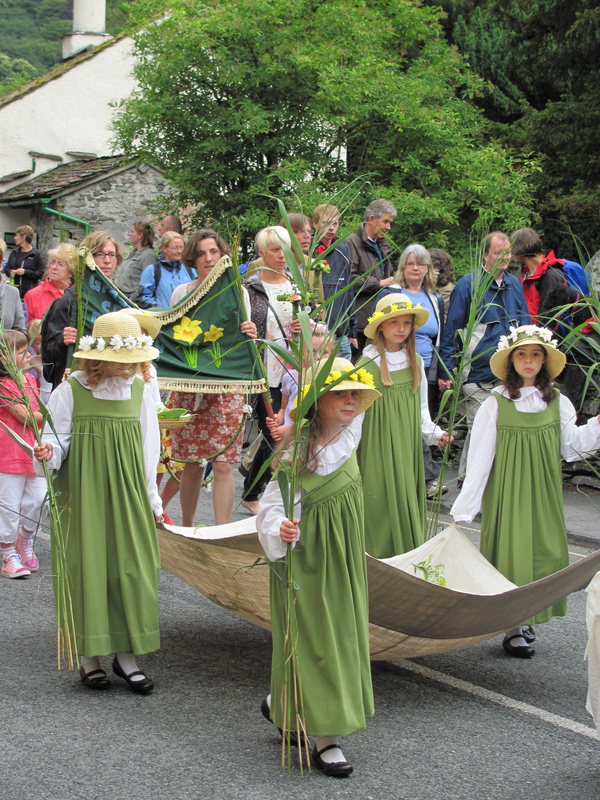 A great Lake District tradition begins. And here comes the band. Villagers young and old(er) took part. Even our local thespian Doctor takes part. Still can’t forget his performance as Toad of Toad Hall in Grasmere Players production a few years ago. 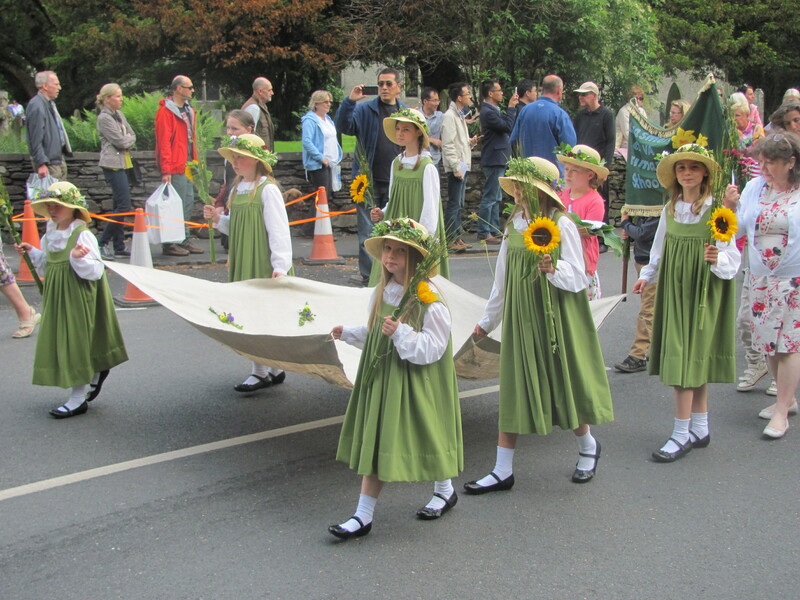 As always the highlight of the parade are the Rushbearing Maidens. 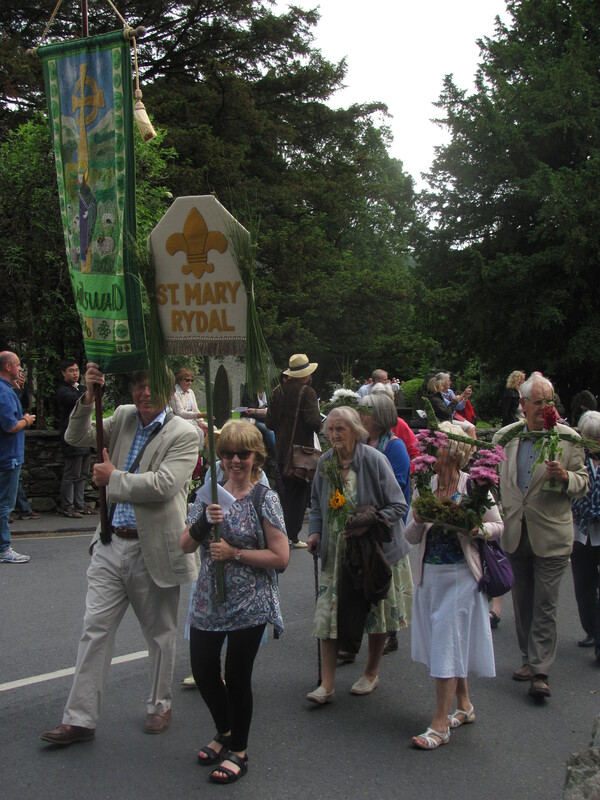 Through the village they process until they reach Moss Parrock in the centre of the village for the Rushbearing hymn. Back through the village again to the Church. Alex who was holding the cross at the start of the parade had been baking scones all day at National Trust Allan Bank and literally ran down the hill to take part. He looks amazingly relaxed! By now these bearings feel heavier and heavier!. 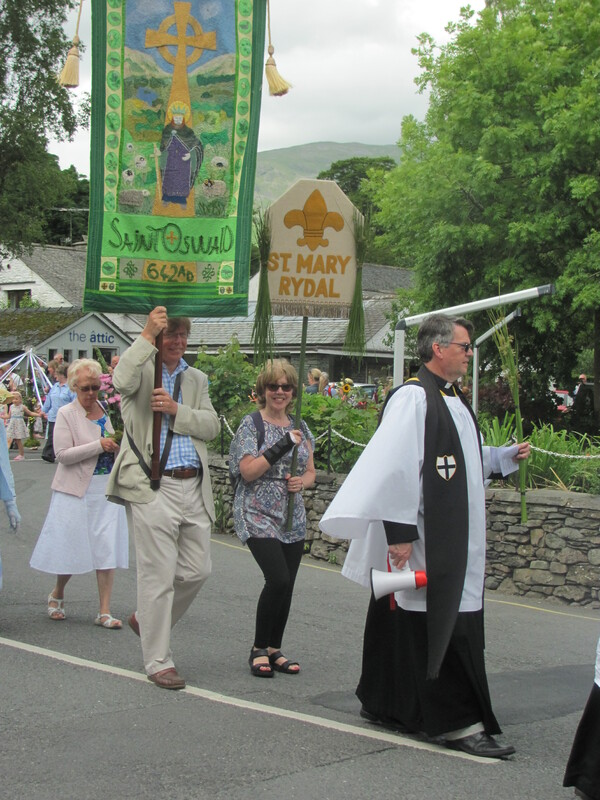 The Rev’d Cameron Butland leads the way back to church for the Rushbearing service. 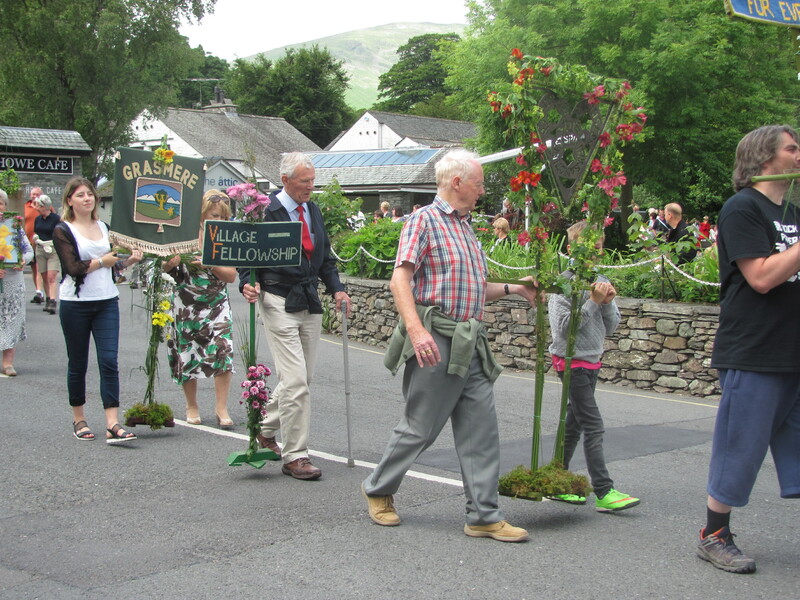 A little bird tells me this may be his last Grasmere Rushbearing Parade. 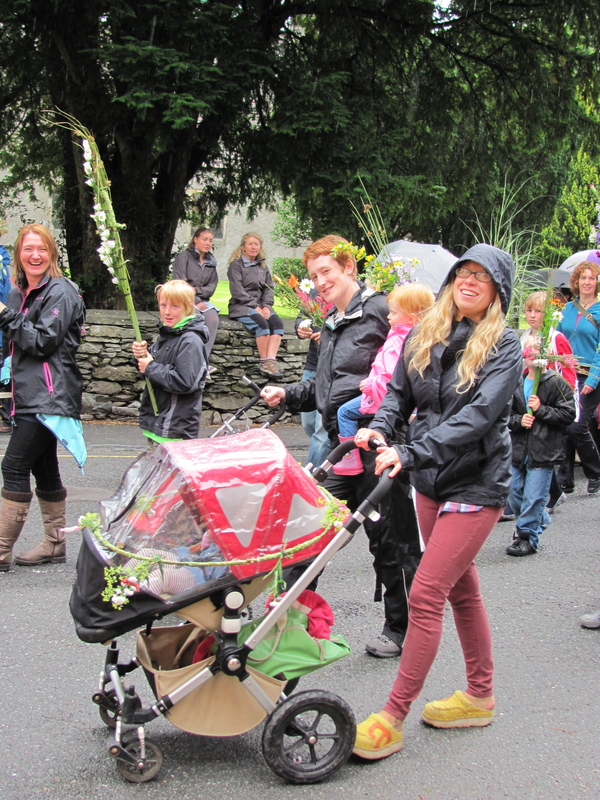 So another Rushbearing Parade escaped the rain! See you in 2016. A good friend who I met through the wonders of Twitter @Loftylion9 was watching the parade with me. She took the beautiful shot below and gave me permission to use it. 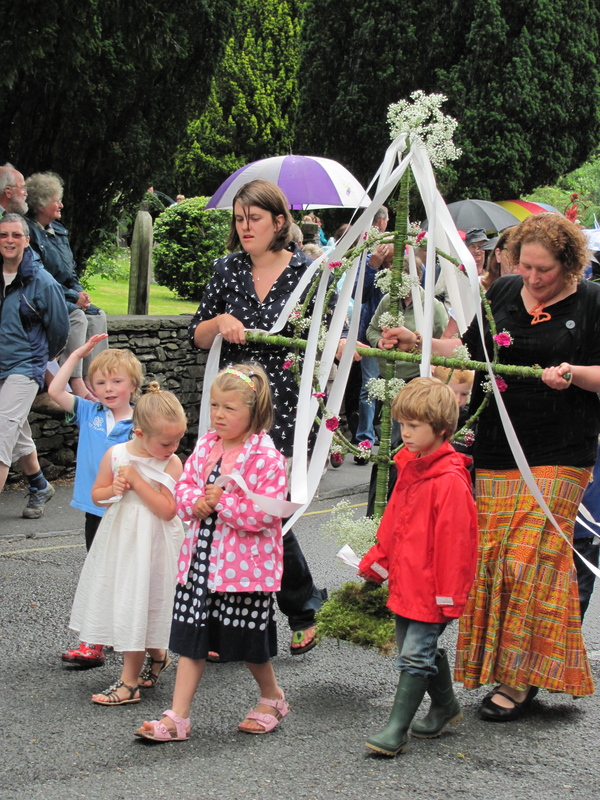 Below is a link to the history of Rushbearing that I previously wrote on this blog. Living in the Lake District you do quite often get slightly fed up with the weather. Ok we all say “well you wouldn’t have the lakes if you didn’t have the rain” but sometimes it would be nice to wake up, pull back the curtains and see the sun shining!. 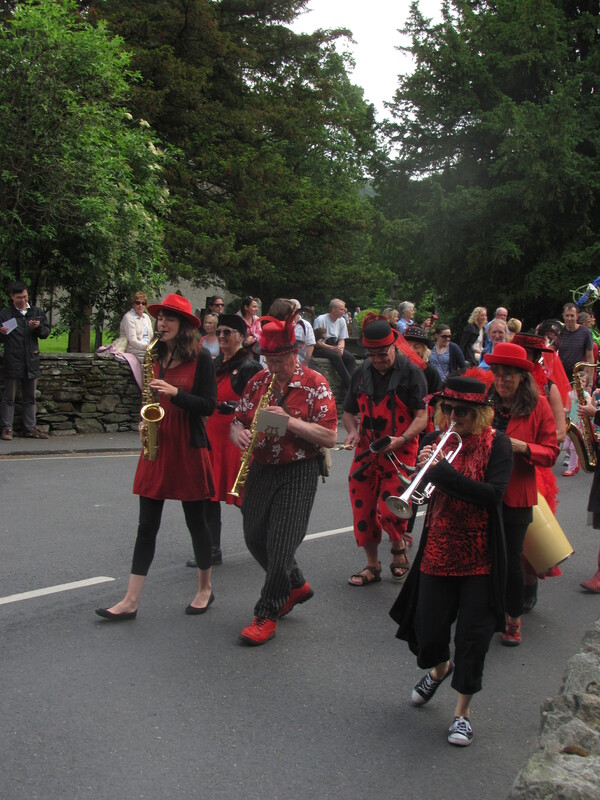 Grasmere Rushbearing is one such day. So much work goes into the preparation for this traditional Lakeland event that it’s fingers crossed all round for fine weather. So guess what ? yet again this year it was raining. For the past few days the little tractor had been chugging backwards and forwards to the church full of rushes from the lake side. 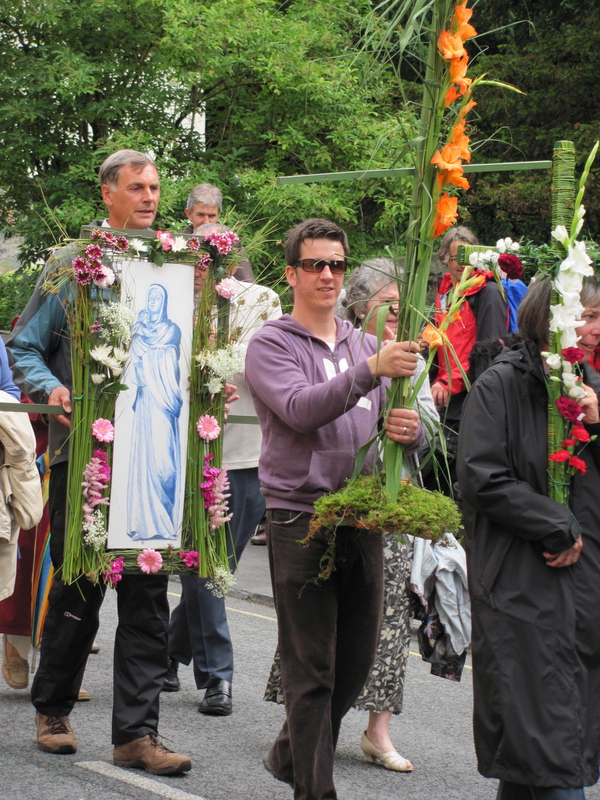 Everyone carried on getting ready, with more than a few glimpses towards the sky. Then as so often happens, right at the last minute, the skies cleared. There were still a few spectators balancing umbrellas but there was nothing like the torrential downpour that had started the day. 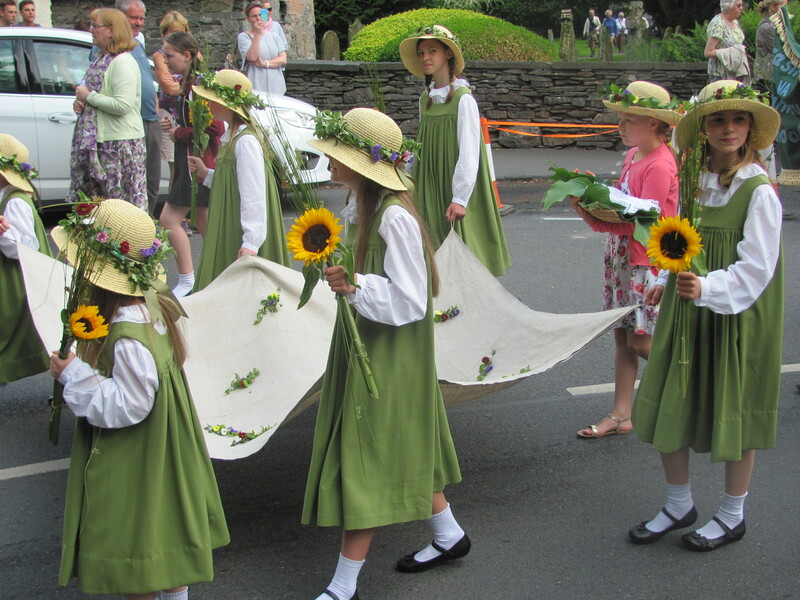 The great thing about Rushbearing is that everyone takes part. 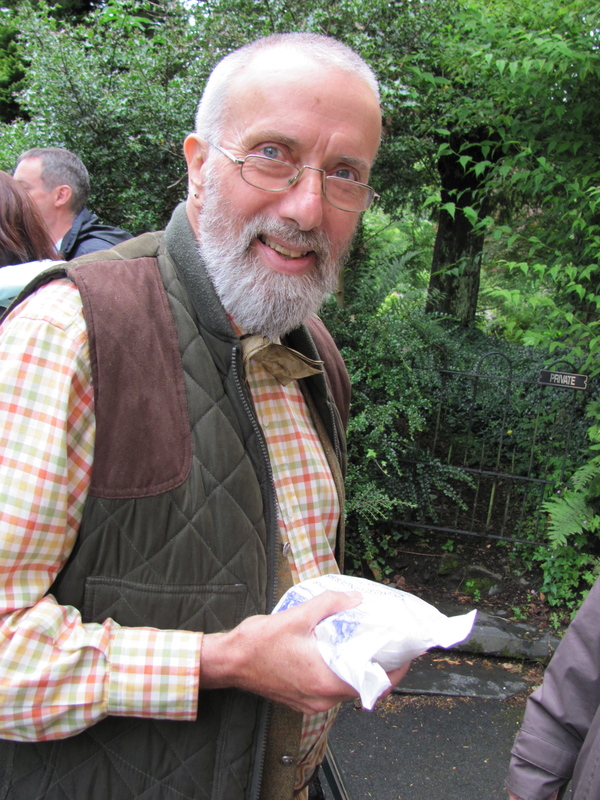 Taffy Thomas who is the current Storyteller Laureate had just finished doing an event in the storytellers garden and was watching the procession while clutching that other Grasmere tradition Grasmere gingerbread! 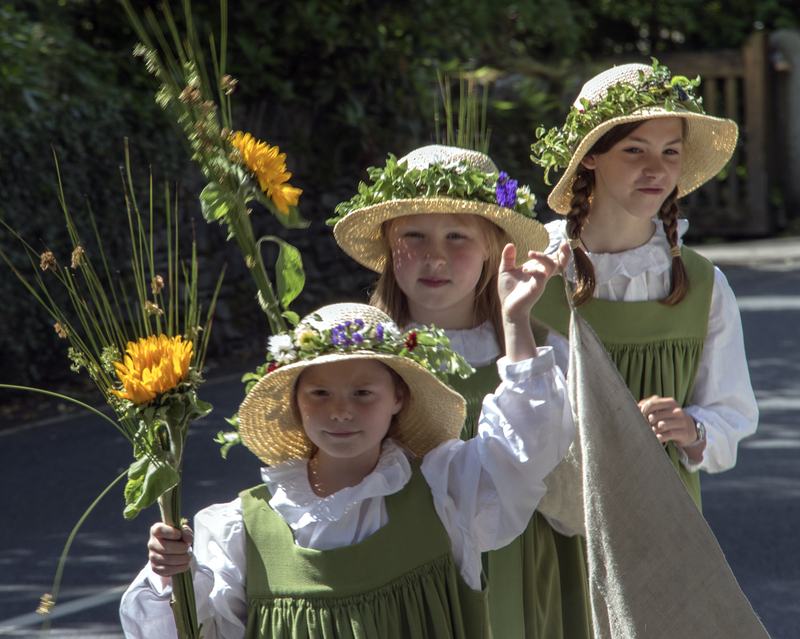 With being a busy tourist village, during the summer months it’s a case of heads down and on with work, but on this day we all come out and celebrate. Being in the tourist industry we tend to do a reverse hibernation. Don’t see anyone in the summer as so busy working, then come winter we all appear and have time to catch up. 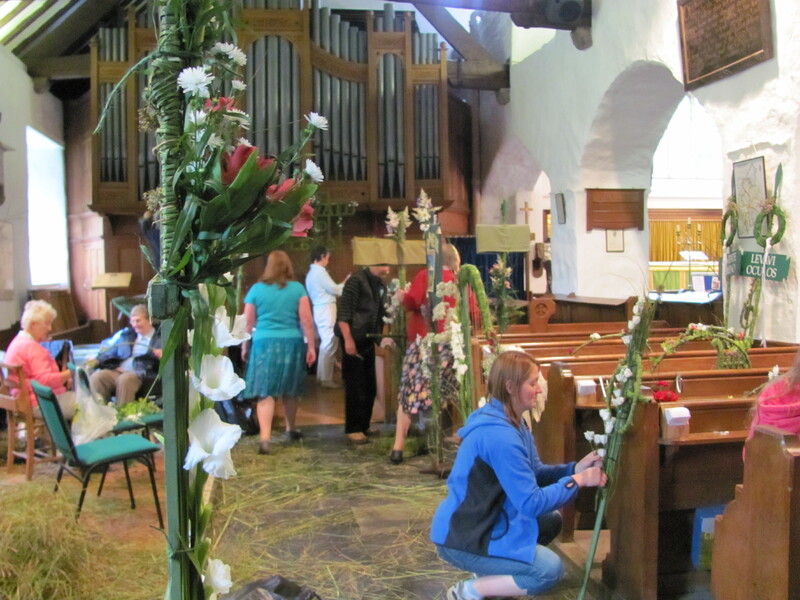 One new adidtion to Rushbearing was spotted in the National Trust Information Centre. 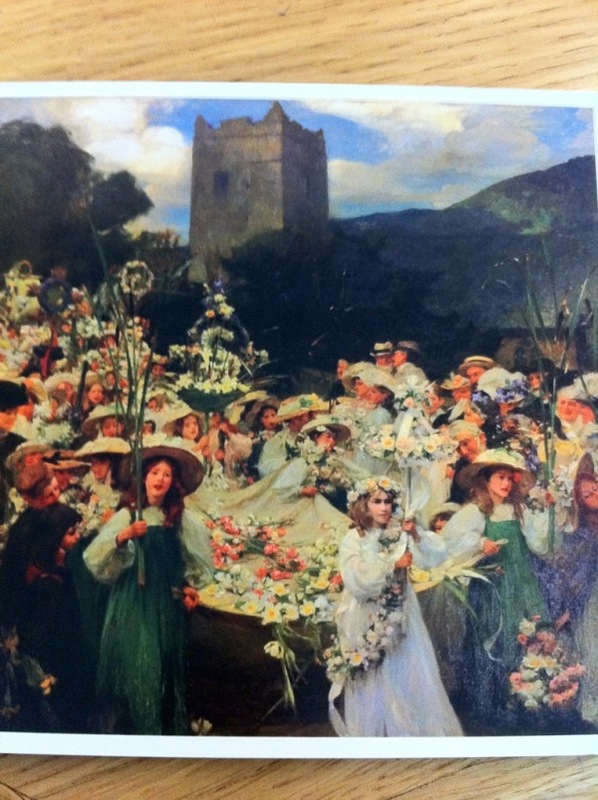 They have produced a greetings card and postcard of the Rushbearing painting by Frank Bramley RA which although purchased by public subscription by the villagers of Grasmere is in the care of National Trust. 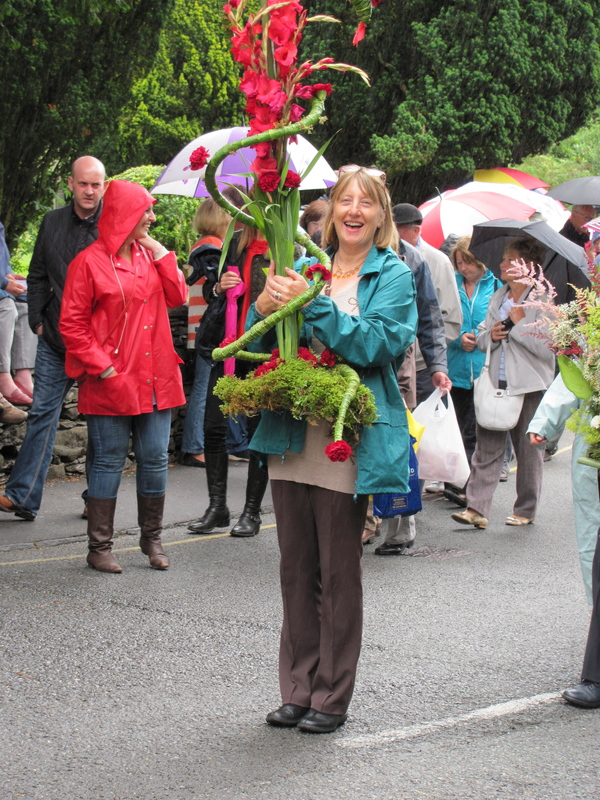 Frank Bramley married Katherine Graham from Huntingstile Grasmere in 1891, hence his link with the village. He was a member of the Newlyn School of Artists. Newlyn was a small fishing village in Cornwall where the light was considered particularly good for painting outdoors. 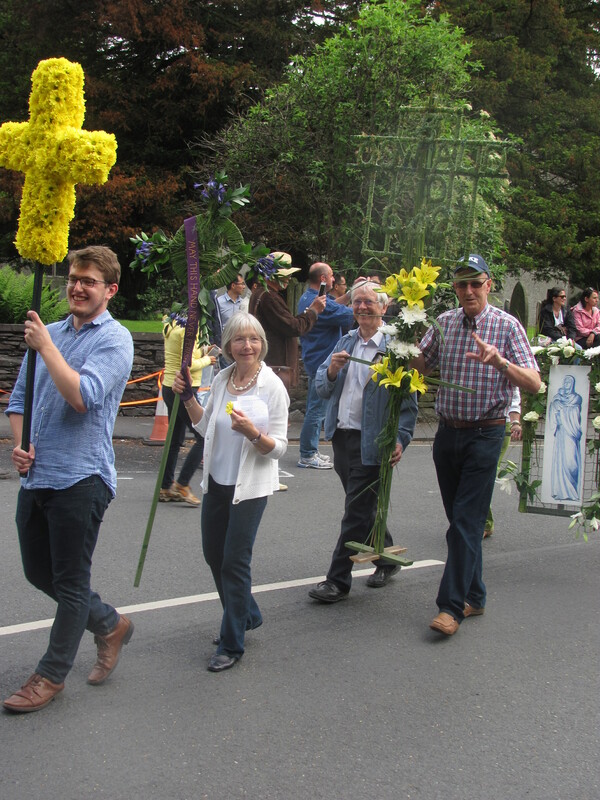 He started the Rushbearing painting in about 1900 and it took him four years to complete. It was exhibited at the Royal Academy in 1905. The painting is seldom seen, however I do hear that there may be plans to let the public view it during next year’s Rushbearing. 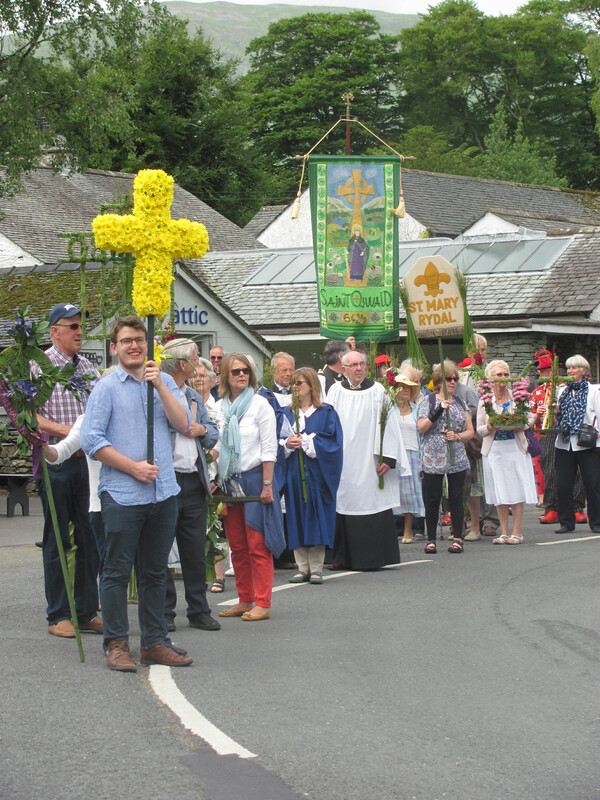 The Rushbearing procession winds it’s way round the village with a brief stop at Moss Parrock before heading back to St. Oswald’s Church. I don’t think many people realise just how heavy some of these bearings can be. 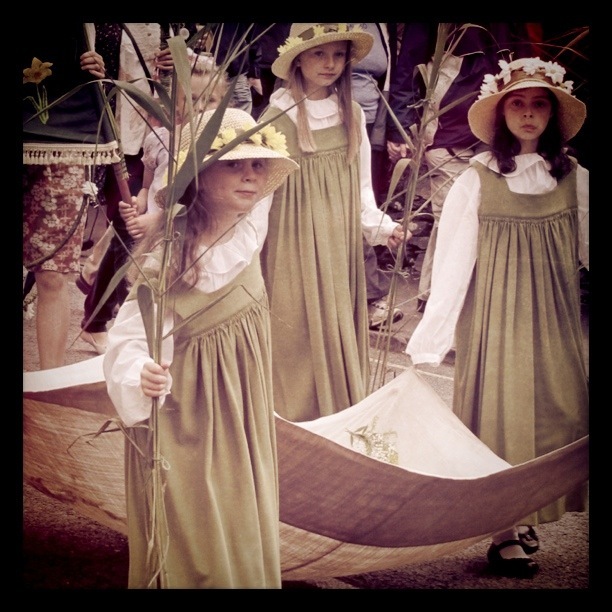 It is great to see such an ancient tradition being celebrated each year and to see the younger children enjoying themselves as much as their parents and grandparents did in the past. 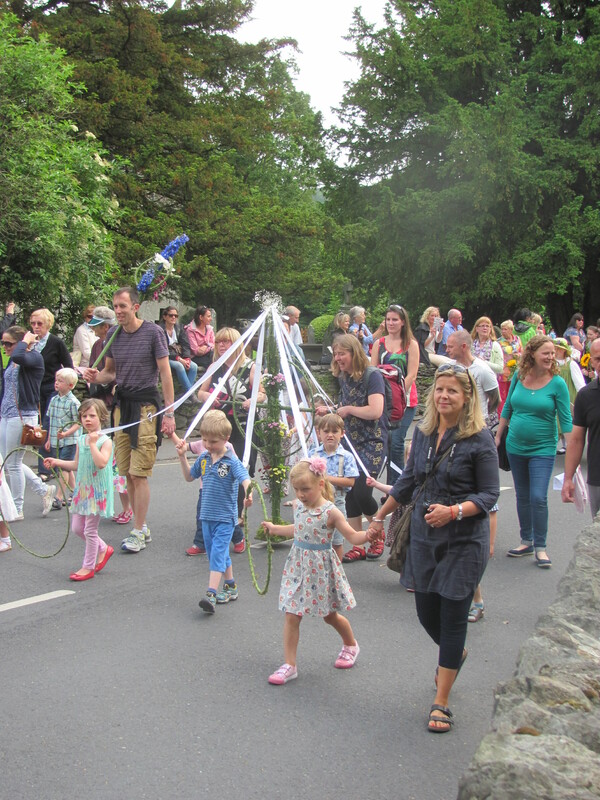 For more information about the history of Rushbearing please see the post I did earlier in this blog.